Aquaforest TestPro Calcium is designed to quickly measure the concentration of Calcium in salted water. Football plays an important role in many biological processes, such as the construction of hard coral calcium skeleton skeletons. 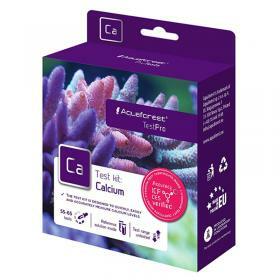 Calcium levels should be analyzed regularly along with other critical water parameters such as alkalinity and magnesium. Calcium levels should be maintained in the range of 400 to 450 mg / l (ppm). The test contains enough reagent to make about 55-65 measurements in that range.